India won total 5 medals on 3rd Day including 1 GOLD, 1 SILVER and 3 BRONZE medals. 2017-07-08 09:00:00 Women 100m Hurdles Heptathlon 1 PURNIMA HEMBRAM 13.75 2nd – 1014 Pts. 2017-07-08 09:00:00 Women 100m Hurdles Heptathlon 1 SWAPNA BARMAN 13.99 4th – 980 Pts. 2017-07-08 09:00:00 Women 100m Hurdles Heptathlon 1 LIKSY JOSEPH 14.65 6th – 888 Pts. Indian Won 4 Gold medals in a day along with 2 Silver and 2 Bronze. 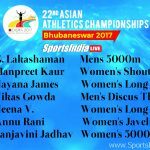 India Won 2 Gold, 1 Silver and 4 Bronze medals in Day 1 of the 22nd Asian Athletics Championship, here in Bhubaneswar. 2017-07-06 09:10:00 Male Long Jump Decathlon-2 ABHISHEK SHETTY 6.62m 7th – 725 Pts.